Reva Turner, age 96, of Brookfield, died Friday, November 30, 2018, at McLarney Manor in Brookfield. Funeral services will be Monday, December 3, 2018, at 11:00 a.m. at Wright Funeral Home in Brookfield with Pastor Rex Leppin officiating. Burial will be in Park Lawn Cemetery in Brookfield. The family will receive friends Monday from 10:00 a.m. until service time at the funeral home. Memorials to Mt. Olive Baptist Church or Mt. Olive Cemetery may be left at or mailed to Wright Funeral Home, P.O. Box 496, Brookfield, MO 64628. Reva Marjorie, daughter of Dewey and Elsie Mae (Paul) Chapman, was born March 17, 1922 on a farm near Eversonville. On March 23, 1940, she married John Lee Turner who preceded her in death on April 27, 1989. Reva was a 1940 graduate of Meadville R-IV High School. She was a homemaker who enjoyed cooking, sewing, and gardening. 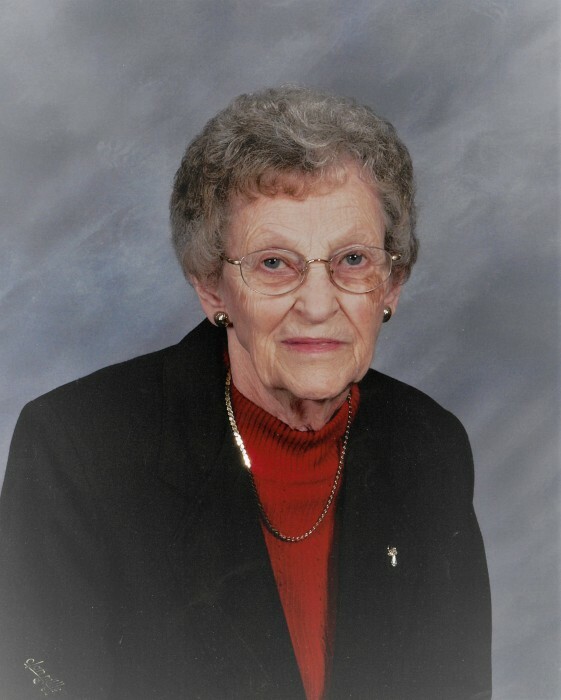 She was a member of the Hecla community Yours & Mine Extension Club and Park Baptist Church in Brookfield. Survivors include three children, John E. Turner and wife, Linda of Ozark, Elsie Jane Corbin of Springfield, and Lana Timmons and husband, Marvin of Linneus; nine grandchildren, Jerry Corbin and wife, Vicki of Flemington, New Jersey, Larry Corbin and wife, Connie of Eureka, John R. Corbin of Manhattan, Illinois, Sharon DeCarlo and husband, Arnold of Frederick, Colorado, David Brinkley and wife, Robyn, Jerry Lee Brinkley and wife, Lori, Heather Phillips and husband, BJ all of Linneus, Aaron Turner and wife, Shelley of California, and David Turner and wife, Maria of Ozark; two step grandchildren, Donna Burton and husband, John of Brookfield, and Jaci Clark and husband, Jason of Shawnee, Kansas; 18 great-grandchildren; six step great-grandchildren; six great great-grandchildren; two step great great-grandchildren; and a sister-in-law, Dorothy Chapman of Chillicothe. Her parents; an infant daughter, Connie Jean Turner; and one brother, Dale Chapman also preceded her in death.